One man, one resolve -- and history is changed! Those words are uttered by the character Lord Charles Fox in the British House of Commons towards the end of the 2006 movie Amazing Grace. 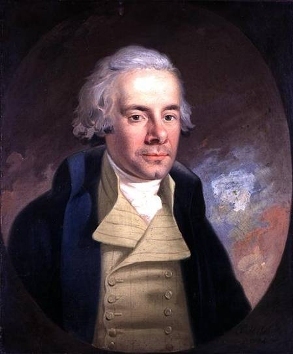 They sum up the singular accomplishment of William Wilberforce (1759 – 1833), British politician, philanthropist and leader of the movement to abolish the slave trade. The movie, based on his true story, is not just a well-made period drama. It also offers dramatic insights into one of the most successful – and consequential – social justice campaigns in history. It reminds us that a determined man or woman can, indeed, make a difference in our complex world. Inspired by a recent visit to Yorkshire, where Wilberforce hailed from, I’ve just watched the movie — and am amazed to find how many such striking parallels there are to evidence-based policy change and law reform in a very different world of ours more than two centuries later. Wikipedia has a good summary of how Wilberforce and his few determined friends sustained a campaign against this inhuman yet highly lucrative trade. Wilberforce was every bit the resolute campaigner: used every trick in the book, and then some. He diligently amassed incriminating evidence about the mass-scale abuse of human rights taking place in far-away Africa and on the high seas transporting captured African slaves. He wrote and spoke extensively using facts and figures as well as appeals to human emotions. He collected eye witness testimonials, and gathered over 300,000 signatures in a petition from ordinary people calling for abolition of slavery — which countered the political argument that people didn’t care. He also worked on and with influential religious and political connections. He surrounded himself with a few trustworthy friends who stay the course despite multiple setbacks, ridicule and character assassination. He was passionate to the point of being obsessive. Yet he also knew when to speak and when to make a tactical retreat. His timing was impeccable as were his patience and commitment. He wasn’t successful with every social justice campaign he took up. First elected to Parliament in 1780, he campaigned unsuccessfully for penal and electoral reform. It was in 1787, at the encouragement of William Pitt the Younger — his long-long friend and Prime Minister — that he took up the cause of abolition at Westminster. But his humanitarian and ethical arguments had to meet the economic interests of those who had made vast fortunes from the slave trade or the use of slave labour. Many of his fellow Parliamentarians had deep vested interests that wanted to see the status quo continue. Others were in the pay of slave traders. It was not until 1807 — full 20 years after Wilberforce first started his campaign — that the Abolition Bill was finally passed. Just before that, Wilberforce wrote his famous ‘Letter on the Abolition of the Slave Trade, Addressed to the Freeholders and Other Inhabitants of Yorkshire’, justifying his preoccupation with abolition against claims that he was neglecting their local interests at Westminster, and setting out all his arguments against the slave trade. Then, as now, elected people’s representatives have to perform this difficult balancing act — between their constituency’s immediate, everyday needs and the greater good or national interest. Which is why all progressive legislators and social justice campaigners should watch Amazing Grace, and read the Wilberforce biography. Times have indeed changed, but their challenges have not.